There seems to be a cookie-cutter culture pervading the recording industry. You see the same questions again and again "Tell me the plug-ins you use, the settings, the best mic, preamp" and so on are endlessly asked in forums and on social media in the vain hope that they can get that great sound too. Who the hell wants to sound the same as everyone else? As an engineer replied when asked how do you get a vocal to sound like Sting, he said "You get Sting to sing it." As if that's not enough there's an entire industry built around giving people mixing templates, this blog has done its fair share of giving away presets for things like Eleven Rack owners and other VIs over the years. I'm beginning to regret it, perhaps we've contributed to the world where some people think that recording and mixing are as simple as loading a template and the same plug-ins everyone else is using, and the 'magic' silver bullet presets. Creativity is rarely this clear cut, not if you want to be original and make something different. Don't get me wrong, templates and presets are helpful, sometimes, but if you just rely on them and never venture beyond the audio equivalent of painting by numbers, then you are not doing yourself or anyone else any favours. This issue is not a new phenomenon; it's been happening since we got presets in synths. I was a programmer in the eighties and as soon as a cool preset emerged then every man and his dog would use it on their latest recording. Some of us played preset bingo when listening to the radio; DX7 bass, Jupiter strings, D50 bells, Korg M1 choir, Emulator brass, Fairlight stabs... bingo! I have a producer friend Pete who can name a preset on a track and tell you what synth or plug-in made it. As we've moved away from hardware and onto computers now everything can be saved, shared, copied and the chance for a serendipitous moment of originality is even more unlikely. Don't get me wrong I'm not one of the 'if it isn't hard then it isn't good' gang, but I am bothered by the dumbing-down of the creation of music. Some suggest it's click tracks that did it; other people claim it is auto-tune or Pro Tools that is to blame, I don't agree. However, if all we do is make music by numbers and play safe, then we've missed the point entirely. 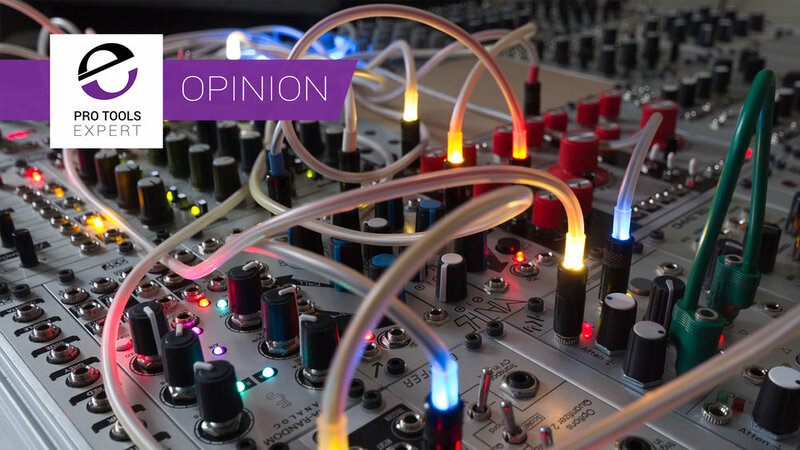 The real magic of making records is not in the predictable but the moments of exploration and sonic enterprise, the moving of a mic around a room, or turning the knob the wrong way, of plugging the cable into the wrong hole on your modular synth. These are the eureka moments, the how the f*ck did we make that sound moments, or finding out there are more beats possible than those that fit into two bars of 4/4. Studios are meant to be alive like a forest full of flora, fauna and uncountable species of insects, animals and birds. It seems many are more like a lab of pressed flowers, pinned butterflies and stuffed animals. Yes, forests are messy, scary and unpredictable, but far more interesting than the lab that tries to lock them into a moment in time. Is this why so many people are keen on vintage studio gear and synths and we are experiencing the modular synth revival? Have we all grown tired of the predictability of a lot of modern music making and found refuge in hardware that we can't save presets on or at best chinagraph the settings until it rubs off? Presets are good in theory but not in practice, take a compressor preset - what's the chance the next bass part you get is going to played exactly the same to tickle the compressor in the same way. By all means use them as a starting point, but just because X producer used X preset on the snare of a Grammy winning record that doesn't mean it's going to work on your track too. Take them for what they are - a sign post in the right direction not a dead cert fix to get you out of audio trouble. Perhaps it's just the way I'm wired, but I like starting from a blank page, so I rarely save presets, even if I've created a 'life-changing' patch or got a killer vocal sound. There's so much more fun in starting again seeing what sound you get the next time, who knows it might be better than the one you thought was the best. Modern music creation tools give us so many exciting possibilities, don't get me wrong it's not all bad, not even close. But if we depend on the easy and quick solutions then we might be missing something far more important - when it comes to creating music the journey is as important as the destination, if not more so! 21 Feature Suggestions For Pro Tools In ACA Vote. We Take A Look At Them And The Future Direction Of The Avid DAW.